Dust and Soot and Snow. Tiny particles of dust and soot have many impacts on climate. PNNL scientists revealed a more detailed picture by simulating its effects on seasonal snowpack, through absorbing sunlight energy and heating the surface. Their technique will be used to understand how snow darkening affects water resources in mountain regions. Enlarge Image. Results: Whether they fall on snow or float in the atmosphere, tiny particles of dust and black carbon (a.k.a. soot) can have a large impact on their surroundings. Researchers at Pacific Northwest National Laboratory led development of a first-of-its-kind, high-resolution regional modeling framework that simulated how light is absorbed by soot and dust in seasonal snowpack. Their detailed simulation better captures the kinds of emissions and processes that influence how after landing on snow, these particles have a great capacity to attract heat. "Our higher resolution regional model captures the spatial heterogeneity of snow, or how unevenly it's distributed, which is important for accurately simulating snow lifetime and its impact on regional climate and hydrological cycle," said Dr. Chun Zhao, PNNL atmospheric scientist who led the study with colleagues from Lanzhou University, Utah State University, University of Michigan and Argonne National Laboratory. 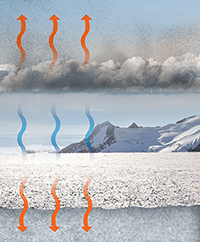 "For the first time, we simulated the kinds of emissions and processes that affect these aerosols and their deposition to snow and ice at a relatively high resolution." Why It Matters: Wind-blown dust and soot from forest fires, diesel exhaust, and other fuel burning are often lofted high in the atmosphere and carried by currents to distant regions. It is well known that these particles act as heating agents by absorbing the sun's energy as they float in the atmosphere. But what happens when they fall to Earth and dirty up the snow and ice that normally act as a giant sun reflector? In regions with lots of ice and snow, such as the Arctic and North China, these particles can affect the surface energy balance, fresh water supplies, fishing, and agriculture. The study looked at seasonal snow over China, but the model technique can be used to understand the impact of these particles on snow in other regions. Methods: This study is the first to couple a meteorological chemistry model with a model that simulates snowpack characteristics, such as reflectance and grain size, to understand how dust and soot particles impact snowpack. Using the Weather Research and Forecasting model with chemistry (WRF-Chem) with a snow model (SNICAR) embedded in the Community Land Model (CLM), they simulated the snow darkening effect of dust and soot over North China. The team compared the model output with observational data from a 2010 field campaign. They also calculated soot and dust mass concentrations in snowpack and estimated the radiative forcing of soot and dust in the atmosphere and snow. Although a variety of observational datasets have been used to evaluate models, some uncertainties remain. This points to a need for more observations, particularly concurrent measurements of atmospheric aerosols, their deposition fluxes to snow, and their concentrations in snow. These observations would further increase model accuracy in simulating the snow darkening effect. The newly developed modeling framework can be used to understand the impact of snow darkening on water resources over mountain regions. What's Next? This study only estimates the increased absorption of solar radiation by dust and soot in snowpack. 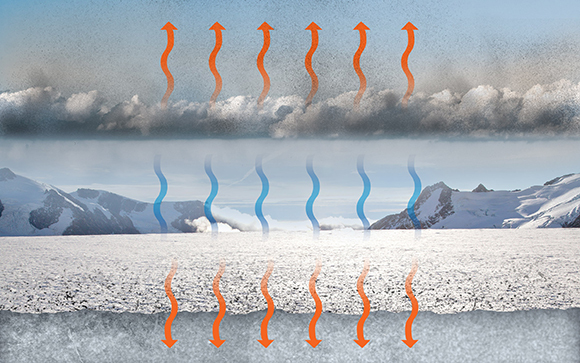 The new technique will be applied in other regions to understand the broader implications of soot and dust deposition in snowpack on the regional climate and water supplies. Sponsor: This research was supported by the U.S. Department of Energy (DOE) Office of Science, Office of Biological and Environmental Research as part of the Regional & Global Climate Modeling Program. Research Team: Chun Zhao, Z Hu, Yun Qian, L. Ruby Leung, Maoyi Huang, Rudong Zhang, Hailong Wang, and H. Yan of PNNL; J. Huang of Lanzhou University, China; J. Jin of Utah State University; M.G. Flanner of the University of Michigan; and Z. Lu and D.G. Streets of Argonne National Laboratory.